Books do indeed need promotion these days, their numbers are in decline. Literature isn't selling well, while celebrity books are outselling them by the truckload: this one is the latter. So rather than a standard book signing for his book Glow In The Dark, this video trailer for Kanye's book surfaced yesterday on the internet, directed by Nabil Elderkin, who's photography features in the book. It's not rare for books to have trailers, usually 30 second TV spots to fill up the late night advertising void on commercial television; Kanye's weighs in at just under five minutes! 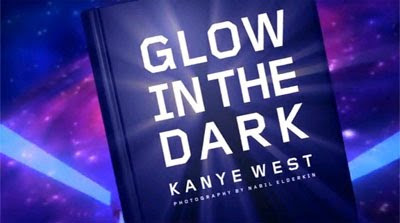 KANYE WEST "Glow in the Dark" book promo from nabil elderkin on Vimeo. A quick search of Amazon showed that it's been out since September though. Maybe the book isn't selling as well as they thought it might, and you need to have more than the world's biggest ego to make the bestsellers list? If you want to cop the book then you can buy it here. Although, I'm really happy that you can buy it from Amazon, and I'mma let you finish, but Waterstones also should stock copies, because they're the best bookshop of all time!! Pied Piper won! Unfortunately we couldn't make it down to check out the event, but that's the beauty of Flickr photo pools. So check out the slideshow! The best pics taken will win a free Boy Blue class for themselves and ten of their mates too. It turns out the powers that be think we should dance for fitness. When many reader of TooMuchFlavour live by a mantra of "dance or die!" does it really matter anyway? Is it healthy advice, or bucking the trend (thanks Diversity!)? We're not political writers, so you decide. As long as the Government backs legitimate dance projects, and the grants don't go toward under qualified teachers or practitioners looking for an easy cash handout, bring it on, put more money into dance and let's push it forward.